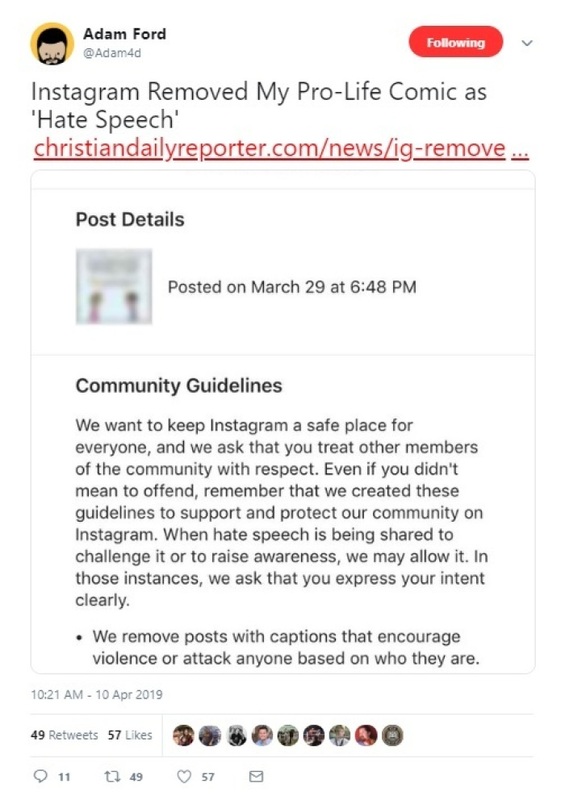 Adam Ford, who sold the Babylon Bee website last year, posted an entry on his Christian Daily Reporter site on Wednesday, explaining that he recently learned that a comic he posted to Instagram last month was taken down. “Instagram yanked it as ‘hate speech,’” wrote Ford, who included a screengrab of the message he received regarding the post. “We want to keep Instagram a safe place for everyone, and we ask that you treat other members of the community with respect,” stated Instagram. “Please, read the entire comic and try to ponder how in the world it could be considered ‘hate speech,’” added Ford, who included the whole comic, which is also available to read here, in its entirety on the Daily Reporter post. “I am hardly the first person to espouse the belief (and hope) that one day society will look back on abortion with the same mortified disbelief we now have when we consider our country's history of institutionalized chattel slavery,” stated Ford. Ford also took to his Instagram account to post a new photo on Wednesday, explaining that the comic was censored, with this post getting nearly 600 likes within a couple of hours. Last year, Facebook threatened Ford’s Babylon Bee page with reduced distribution and demonetization in response to a Snopes piece fact-checking one of their satirical stories. “There’s a difference between false news and satire,” said Facebook in a statement to the Daily Caller News Foundation at the time. “This was a mistake and should not have been rated false in our system. It’s since been corrected and won’t count against the domain in any way."